The .ivr (Internet Video Recording) is a video file format used by the RealPlayer software from RealNetworks. The procedures to convert .ivr files to .wma (Windows Media Audio) or .mp3 (MPEG-1 Audio Layer 3) format using the free RealPlayer are different depending on your RealPlayer version. Assume that you are using Windows XP Professional SP3 Operating System (OS). The procedures below show how to convert your .ivr files to .mp3 (MPEG-1 Audio Layer 3) format using the free RealPlayer Converter that comes with the RealPlayer v15. Please download and install RealPlayer version 15.0.6.14 (win32) or higher version from RealNetworks. In Windows XP OS, please click Start -> All Programs -> RealNetworks -> RealPlayer Converter. In RealPlayer Converter, kindly click "Add..." to add your .ivr files. In "Convert to:", please choose "MP3 Audio Only". The default MP3 quality is "128 kbps Stereo" and the default "Save in:" "Same directory as original" are fine with me. Click the "Start" button to start the .ivr to .mp3 conversion. The procedures below show how to convert your .ivr files to .wma (Windows Media Audio) or .mp3 (MPEG-1 Audio Layer 3) format using the free RealPlayer v11 and a USB thumbdrive or flash drive. You can use WinRaR to unzip the RealPlayer11GOLD.rar. Kindly install RealPlayer v11.1 (basic version will do, no need to get Premium version) to your computer. Please plug in your USB thumbdrive or flash drive. In RealPlayer v11, click "My Library" -> "Playlists" -> "New Playlist". Give your Playlist a name. Then, click the "Add Clips" to add your .ivr files to this Playlist. a) If all the clip names are all the same after adding your .ivr files, it is advisable to change every clip names to a different name so that when RealPlayer converts your .ivr clips to .wma or .mp3 format, it will not stop at the first clip. b) If your .ivr files are stored in a folder name in Chinese characters, it is advisable to rename the Chinese characters folder name to English characters to avoid error in adding the .ivr clips into the Playlist. In RealPlayer v11, click "Burn/Transfer". If you have not install the VideoBurn plugin (11430 KB), RealPlayer v11 will automatically download and install it for you. In RealPlayer v11, at the "Current Burner/Device", click to select your USB thumbdrive. Then, at "My Library" on the Left Hand Side (LHS) of the RealPlayer, double-click "Playlist" -> "playlistThatYouHaveJustCreated". Click "Change Options..." locates at the bottom LHS of RealPlayer. Click the "Transfer" tab. You can choose to convert your .ivr clips to "MP3", "MP3 VBR" or "Windows Media Audio (.wma)" format. You can also choose the quality of the convert clips. As I want to convert the .ivr files to .mp3 format, I select "MP3" and set the quality as "192 Kbps Stereo". In RealPlayer v11, after setting your "Change Options...", click to select one of the clip names. Then, right-click and choose "select all" to select all the clips. 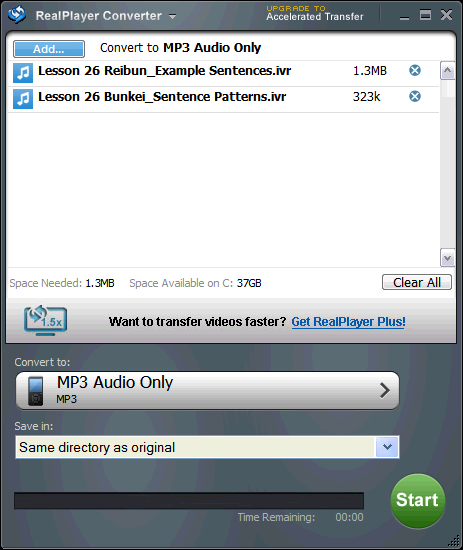 Click the "Add Selected to Device" button to let RealPlayer convert your .ivr files to .wma or .mp3 format, and store the convert .ivr files to your selected USB thumbdrive. The Best and clever way to do the job. Thanks! Clear instruction! you may also convert your audio files here Convert Audio Online its pretty cool! Do I need Real "premium" or should I be able as is. Thanks for your feedback. I assume that you are using RealPlayer v15 (latest version as in 12 Oct 2012). RealPlayer v15 cannot convert .ivr to .wma or .mp3 format. Please use RealPlayer Converter that comes with RealPlayer v15 to perform the .ivr to .mp3 conversion. Fyi.